Why do companies use urine drug screenings? According to Debra Stang’s article on urine drug testing, one of the main benefits a company can experience from drug testing, is that it can keep those who test positive for drugs out of a job. The problem is that our state laws have been evolving in favor of cannabis while company policies have remained unchanged. According to The Washington Post, 99% of employer requested drug tests performed in Colorado and Washington today still look for THC. Cannabis has been shown to help people stay more focused, feel less anxiety, and overall be happier. By excluding cannabis users from their candidate pool; a company is severely limiting itself. In this article, I am going to explore some of the current issues with urine drug testing for cannabis. One issue associated with urine testing for cannabis is its recreational status. In 2012 Colorado became the first state to legalize the use of recreational cannabis for adults 21 and over. 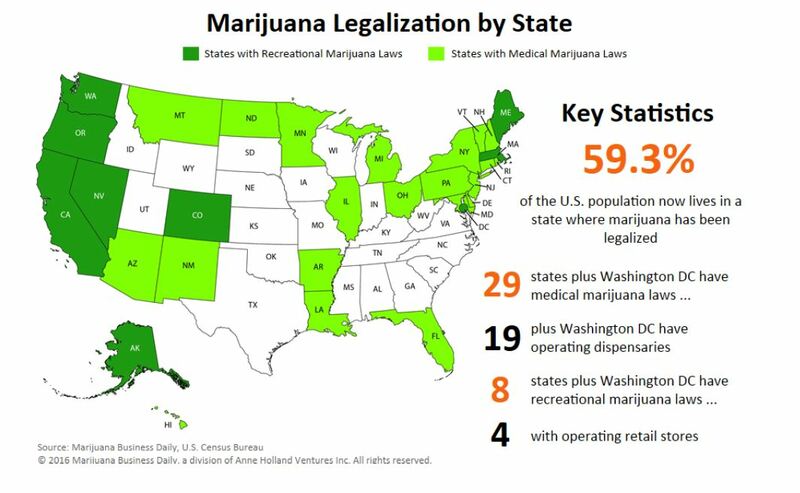 Now there are 8 states plus Washington D.C. allowing recreational use. Matthew Karnes, founder of a firm that provides analysis and research for the legal cannabis industry, predicts by 2021 all states will have either a medical or fully legal program in place. Recreational state or not, to punish someone for something considered legal where and when they did it is wrong. Perhaps the biggest problem associated with urine testing for cannabis is that THC stays in your system for up to 30 days. While THC can be detected for about a month you only feel the effects for a few hours. The only other substances detectable through urine for as long as cannabis are Benzodiazepines. These are medications such as Xanax, Klonopin, and Lorazepam; which are commonly used for the treatment of things such as anxiety, panic disorder, seizures, and sleeping disorders. All the other drugs we test for are undetectable through urine in a matter of days. This is a problem because someone can smoke cannabis in a recreational state and a week later fail a drug test. The test doesn’t really give the company the information they are looking for (is the employee under the influence of cannabis while working). The argument has been made that if a person can’t quit smoking cannabis long enough to pass a drug test they must have a problem, addiction, or be lazy. I completely disagree with these stigmas. There are a lot of people that use cannabis for medical purposes. Asking them to give it up for at least 30 days would be asking them to suffer with seizures, muscle spasms, pain, and so much more. In 1996 California became the first state to legalize medical cannabis use with a doctor’s prescription. Since then 28 other states have joined the medical marijuana movement including over 60 different qualifying conditions between all states (Leafly, “Qualifying Conditions”). With the list of qualifying conditions expected to grow as more research is done, the number of medical cannabis patients is also likely to grow. To exclude people as employees simply because they have smoked marijuana sometime in the past 30 days should be considered a form of discrimination. We do not punish people for using other pain killers and medication that are prescribed by a doctor. Why should cannabis be any different? With so many people using cannabis legally today, we need to consider alternative ways to detect when a person is under the influence. As you can see the urine test is flawed. That doesn’t mean that we should give up on detection methods all together though. If a company needs completely sober employees while on shift, there should be a more accurate way to determine sobriety. One current possible alternative is a saliva test. A saliva test swabs the inside of a person’s mouth to measure the THC levels. This detection method is supposed to be targeted towards a person’s consumption of cannabis in the last few hours. However, it is possible to get a positive result up to a few days after consumption occurred. Ultimately more research is needed to develop better alternative testing methods. One thing is certain though, if the number of cannabis users is expected to grow it would be smart for companies to reexamine their cannabis testing policies. Written By: Jessica Boespflug September 9, 2017. Javier, Hasse. “6 Next States Predicted to Legalize Weed by 2018.” High Times, 4 May 2017, hightimes.com.